A child was killed when Tropical Storm Gordon made landfall on Tuesday, pounding states along the US Gulf Coast with wind, rain and surge waves. The Escambia County Sheriff's Office said a tree fell on a mobile home near Pensacola on Tuesday night. It did not give a name or age of the child. A state of emergency has been declared in Louisiana, Alabama, and Mississippi. 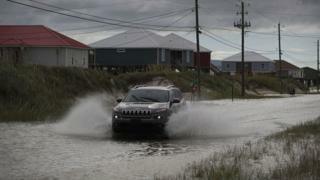 Thousands were reported to be without power on Wednesday morning despite Gordon's downgrade from a hurricane to a depression. Gordon made landfall just west of the Alabama-Mississippi border, the National Hurricane Center (NHC) said, with sustained winds of up to 70mph (110km/h). The NHC had warned of "life-threatening" storm surges, and possible tornadoes. The child was "found deceased" just before 21:00 local time and no one else inside the home was injured, said the Escambia County Sheriff's Office. Gordon strengthened as it neared the coast on Tuesday, but did not reach hurricane status. "Rapid weakening is forecast after Gordon moves inland, and is forecast to become a tropical depression on Wednesday," the NHC said in an advisory. By Wednesday, wind speeds had dropped to 30mph, as the storm continued to move inland. Heavy rains and the chance of flooding will continue for several days, according to the NHC. More than 27,000 customers were hit by power cuts, the Associated Press news agency reported, mostly in coastal Alabama and south-eastern Mississippi. Oil and gas companies in the Gulf of Mexico also evacuated more than 50 platforms as the storm swept in, temporarily halting production. The National Weather Service in New Orleans gave tips to city residents how to prepare for the arrival of the storm. Meanwhile, New Orleans Mayor LaToya Cantrell warned: "The city's absolute number one priority is to ensure the safety of our residents." New Orleans was devastated by deadly Hurricane Katrina in 2005.